Editor's Note: Click on the link below to read the New York Times online version of the article about the Kew Gardens movie. The link will open in a new window. Close out the window to return here. The hard copy will go on sale tomorrow. Editor's Note: Today's issue of New York Newsday (a local newspaper) has an article on the October 9th filming. Click on the link below to read it. The link will open in a new window. Close out the window to return here. Remember, the New York Times article on the filming is due out this coming Sunday. I love Kew Gardens and always will. My parents still live in the house my family grew up in and I still go up to Dani's Pizzeria and the Austin Ale House a great deal. I currently live in Woodhaven now. My name is Arlene Mielczarski (formerly Young). 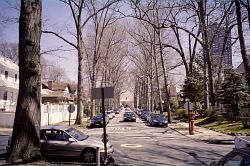 I lived on Park Lane South (between 112th and 115th Street) from 1965 to 1988. I graduated from Richmond Hill HS in 1976. My e-mail address is a.mielczarski@worldnet.att.net. I found this site by accident when I was looking up information in Kew Gardens. My parents are Joan and Donald Young and I have two sisters and one brother - Nancy, Tracey and Donald Young. I also went to Holy Child Jesus Grammar School in Richmond Hill growing up. I'm told that this coming Sunday's New York Times will have an article about the October 9th filming of the Kew Gardens movie in its City Section. I'm also told that the article will refer to the Class of 1954 Reunion on that same date. Diane Shaman of the Kew Gardens Community Center directed my wife, Marjorie, to the site. I graduated from P.S.99 in January, 1946 and I recognize almost all of my classmates. I still live in Kew Gardens, My sons, now grown of course, were graduated from P.S. 99 also. I am a retired teacher. The site is very special to me because it recalls fond memories of my early life. You've done a terrific job. I have some pictures of Kew Gardens when I was a boy. I'll get them out, scan them at Kinko's and send them to you if you want them. You may publish my email address. Just stumbled on this site-wow! 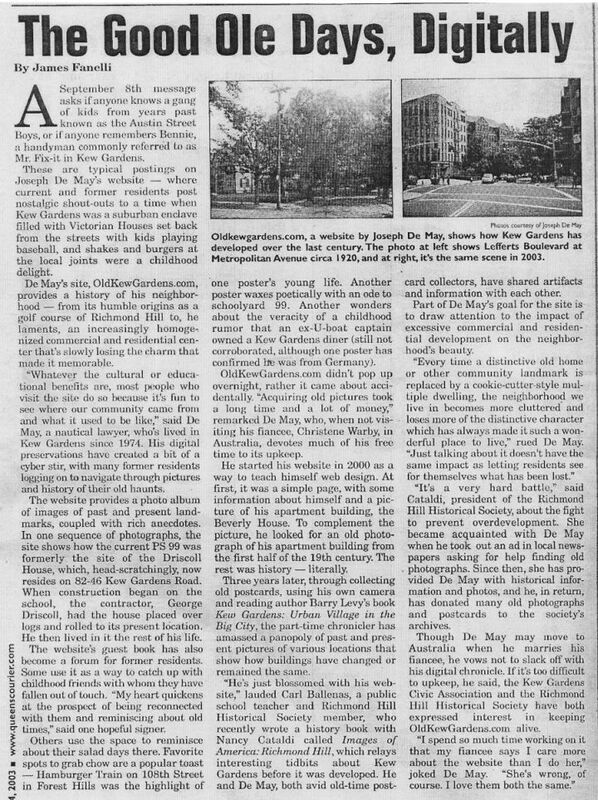 So many memories...I lived in Kew Gardens from 1951 til I went away to college in 1968; my parents lived in the house I grew up in at 119 81st Avenue until very recently and now my "baby" brother Lenny and his family are there. Will write more when I''m not supposed to be "working" but had to get a quick note in. Have a stash of old pictures that I'll have to figure out how to attach and forward. Would love to hear from old buddies and re-connect. Feel free to email at epicker@bidmc.harvard.edu. Will write more soon. Hope the new year is a happy and healthy one for everyone full of success in the things that are important to you. Can anyone tell me what was on the site of the Beverly House at 84-51 Beverly Road prior to 1939? I think it may have been a synagogue. I lived in Kew Gardens from 1934 to 1949 and graduated from PS 99 in January, 1942, so yes, I am older than dirt. 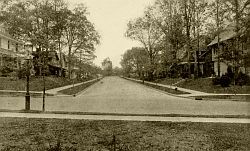 Editor's Note: Before the Beverly House was built in 1939, the plot was the location of the Fleischmann mansion which served for a number of years Temple Isaiah. Editor's Note: Thanks to Anne Parnas Skandera for a slideshow (on another web site) of the P.S. 99 Class of 1954 reunion last Sunday. The link below will open in a new window. close out the window to return here. Since 1990 the Historic Districts Council, citywide advocate for New York's historic districts and neighborhoods meriting preservation, has honored individuals who have shown unusual devotion and aggressiveness in protecting historic districts. This year HDC honors BARRY LEWIS, architectural and urban historian, tour guide, TV personality, tireless advocate for the preservation of New York's heritage, and author of "KEW GARDENS: Urban Village in the Big City." The 2005 Landmarks Lion Award will be presented to Barry Lewis on Wednesday, October 26, 2005. 6:00pm: Reception, Award Ceremony AND LECTURE at the Great Hall of Cooper Union, 3d Avenue at 8th Street, Manhattan, cost $75. 7:30pm, Dinner at Village Restauarnt, 62 West 9th Sreet, Manhattan, cost $250 (including admission to the 6:00pm event). For tickets and info: Historic Districts Council, 232 East 11th St, NY 10003; tel: 212-614-9107; e-mail: hdc@hdc.org. just to let you know that Jessica Valiente, a fantastic flutist, who has appeared many times at the music and poetry show at the Bliss Cafe, as well as having made numerous concert appearances throughout the metropolitan area, entertained at the Theater Cafe in Forest Hills with her 3 piece band. She wowed the audience, as did Michael Barry, guitarist and Anna Milat-Meyer, acoustic bass player. On Tuesday, October 18th, she can be seen (at no charge)at Cuny Graduate Center, 365 5th Ave. at the Elebash Recital Hall at 7:30 PM. She will be doing her Doctoral Dissertation Recital. I advise everyone who hasn't yet seen or listened to her, to attend. She is a musician of great magnitude. It was a marvelous day. Seeing a few "old" friends with whom I used to play ball or cards or just hang out. It was nice to know that they all remembered my family, and my house (just across the street) which looks fantastic. I too wish that more of us were there but, I appreciate all those that made the effort to enjoy the few hours we spent together walking around the old neighborhood. My thanks to Joe, once again, for organizing and adding great value to our childhood souvenirs. I'd like to think we could do better with attendance in future years. So do not hesitate to contact me. Our family lives in Stamford, CT. They say "you can't go back". I believe we proved "them" wrong. The picture depicting the lemonade sale brought back memories for me--I lived in Kent Manor at the same time as the three boys (I believe the correct name was Steven Kliedman) in the picture and knew them all well. I can remember Alan St. George outfitted with a bowler hat and cane barking the sale price of the lemonade and how fresh it is. The line of customers went half way back up the hill leading away from Kent Manor. I attended the 10/9/05 reunion and enjoyed it thoroughly. I am from the class of 1954, which had 7 attendee's. Our class would like to expand the 1954 group for a future reunion. Any graduates of PS 99 from 1954 please contact me. I wish I had been there yesterday. It sounds like it was wonderful. I'm loking for Lenny's poems now on the website. I especially enjoyed the guest list entry from John Mihoulides as my brother, Martin glass was friends with Tom. It's fascinating that he lives on a houseboat now.the other thing that touched me was your reference to Nick. I found out from Leonard Schnier that he had died at such a young age. My heart broke, and still is, because he was my first love and I never forget him. Also, I was always enamored by the lifestyle of your famiy as compared to mine in a big house on 82nd road. I am so sorry that two of your brothers have died. Editor's Note: Thanks to Anne Parnas Skandera for this c. 1948 clipping about a P.S. 99 lemonade sale.. IF YOU WOULD LIKE TO READ MY KEW GARDENS INSPIRED POETRY TYPE SCHNEIR IN THE SEARCH BOX AT THE BOTTOM OF THE HOME PAGE. The '65 R.H.H.S. Reunion Weekend was a big success....Party, School Tour, Jahn's was FUN ,FUN ,FUN!Thanks to all who helped in the planning, and to those who attended .let's not wait 10 to repeat. The next poetry and music show will be held at the Bliss Cafe on Friday, October 21st, starting at 7:30 P.M.
My father Friedrich and Mother Babetta moved to the area from NJ in 1930 and moved to Germany in 1933. I attended P.S. 99 for Grade 1 in 1931 and Grade 3 in 1932 only. I have no old photos unfortunately. My son found this site with a webcrawler search of “PS99 New York”. He is in NY for business next week and wanted to visit some of places where I grew up. It looks like everything is in place for Sunday, October 9th's get-together. I'm very excited to see everybody and think it'll be a big turnout. I have a film crew hired and we now need to have your help with some details. So that everything clicks, there's a need to respond to this email, but NOT to this address... So read carefully. We're going to meet, rain or shine, in front of P.S. 99. People will start arriving at 10:30 A.M. I'm bringing my children and grandchildren to show them the old neighborhood and hope you'll do the same (also it's nice to have young people in our film!). Bring a pencil. You'll need to sign a release form so we can film you. It'll also be a way for us to get good contact info. We need to get a handle on the number of people attending. IF you're coming please send a blank email to: ithacamovies@gmail.com. In the subject area put the the fact that you're coming and the number of people coming with you. For instance "4 attending"
If you have clear pictures of yourself, particularly at school age, or interesting photos of early Kew Gardens (the 40's & 50's) or home movies, we might like to incorporate them in the film. We need either high quality copies or originals (Xeroxes aren't good enough). If originals, you could supply a stamped, self-addressed envelope for safe returnThat would be an enormous help. We are going to make a loop, walking down Lefferts Blvd, then right on Metropolitan Ave. up to Kent Manor and the Park. By 1 PM we'll then return to Austin Street where I've made arrangements for lunch at the Austin Steak & Ale House.